In Calvert County, about 1 in 5 adults and teens use tobacco on a regular basis. The list of diseases caused by smoking has been expanded to include abdominal aortic aneurysm, acute myeloid leukemia, cataract, cervical cancer, kidney cancer, pancreatic cancer, pneumonia, periodontitis, and stomach cancer. These are in addition to diseases previously known to be caused by smoking, including bladder, esophageal, laryngeal, lung, oral, and throat cancers, chronic lung diseases, coronary heart and cardiovascular diseases, as well as reproductive effects and sudden infant death syndrome. ARE YOU SERIOUS ABOUT QUITTING? 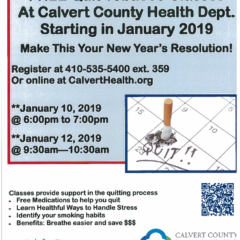 The Calvert County Health Department offers a FREE comprehensive Smoking Cessation Program. The eight week program uses a combination of behavioral counseling and a variety of cessation products. The cessation products are provided free of charge only to individuals who are REGISTERED, ATTEND and PARTICIPATE in the Program. There are approximately 4000 chemicals in cigarette smoke, many of them toxic. The ingredients in cigarettes affect everything from the internal functioning of organs to the efficiency of the body’s immune system. The effects of cigarette smoking are destructive and widespread. Nicotine reaches the brain within 7 seconds after smoke is inhaled. It has been found in every part of the body and in breast milk.